Sorry...2 inch only on 1500. I agree. Buy yourself an AM only radio too, in case the modern stereo goes out. Interesting you should ask. I have a 2016 escalade esv with the first brakes. I'm replacing with ac Delco pads and rotors for about 150.00 for the parts. Amazon. My card gives another 5 % off. Getting power boards? That's what I did. Twice. The dealer can get all those decals. The problem with a cover outside is that wind can move it around and will cause paint damage. Inside, not a problem. 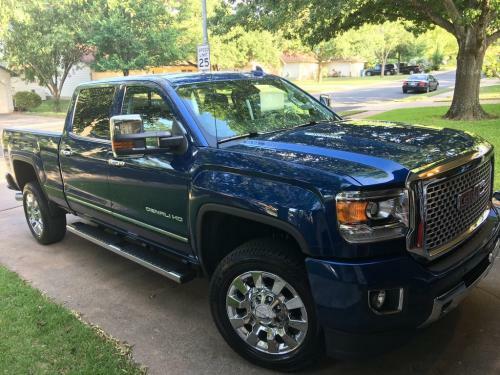 I had a 2500 HD Denali, and lowering the rear air pressure did help a lot, and was free. My son Andrew did extensive research this year on just this subject. He lives in Reno, where they are required in winter. He bought BFG Radial TA KO2. The 6.2 has come a long way. I have a 2016 Escalade ESV and I get 17 in town and 22 on the road. I'm impressed. My new 2019 Ram gets 13.7 in town and my former 3.5 EcoBoost, with more power, got 16 in town. I have the base 3.21 rear and the Ford had 3.55. It's a statistical anomaly that everybody that posts dislikes start/stop technology. Kind of like mostly only complainers post reviews. Better get used to either new technology or complaining, because one or the other will prevail. Black vinyl-wrapped B-pillar....yay or nay? You like it, I love it. Do what you want! And anyway, your friends with 4 wd can pull you out if needed. I use mine when it starts raining. ...just pulling your chain. Nice build.